Dr. Wengui Li is a Lecturer and an ARC DECRA Fellow in School of Civil & Environmental Engineering at University of Technology Sydney (UTS), Australia. Dr. Li received his Doctoral degree of Structural Engineering in 2013 under a joint program between Tongji University, China and Northwestern University, USA. From 2010 to 2013, he studied with Prof. Surendra P. Shah in Center for Advanced Cement-Based Materials (ACBM) at Northwestern University, USA. 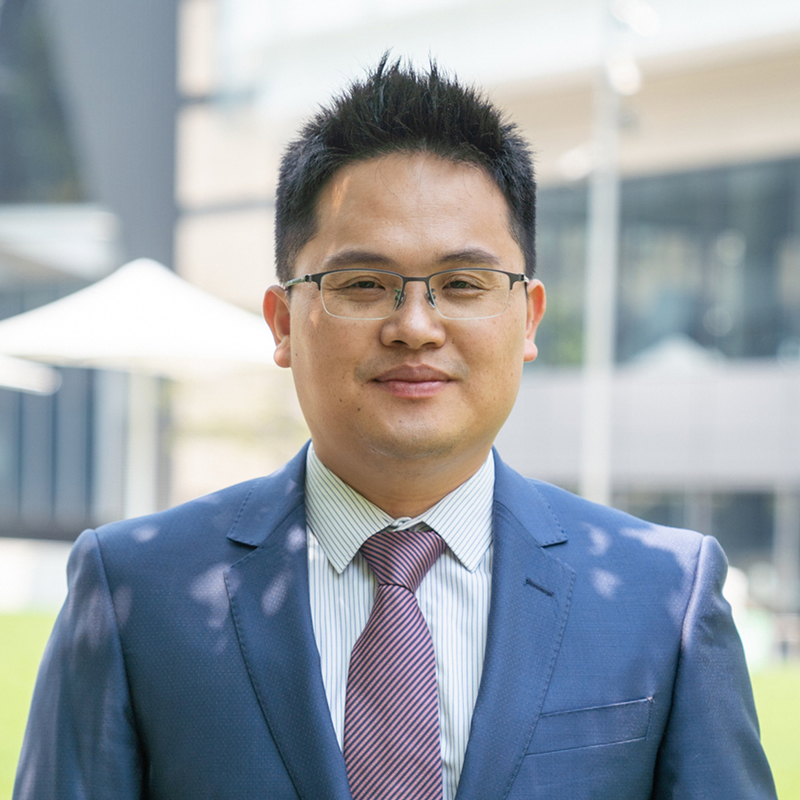 Dr. Li was awarded the Australia Research Council Discovery Early Career Researcher Award (ARC DECRA Fellow) in 2015. He joined University of Technology Sydney as a Lecturer in 2016. Dr. Li’s research interests mainly concentrate on construction materials and concrete structures. He is a core member in Centre for Built Infrastructure Research (CBIR) in School of Civil and Environmental Engineering of UTS. He is members of American Institute of Concrete (ACI), American Society of Civil Engineers (ASCE), International Union of Laboratories and Experts in Construction Materials, Systems and Structures (RILEM) and Concrete Institute of Australia (CIA). Dr Li’s research motivation is to connect materials behaviors of concrete to structures performances. His current research interests include recycled concrete, self-healing and self-sensing concrete, concrete nanotechnology, geopolymer concrete, durability under extremes, fire resistance, prefabricated structures and sustainable construction materials. Dr Li has been the reviewers for a number of international Journals in the areas of concrete materials and structures. Dr. Li has published more than 70 international journal papers, and also reviewed papers of 20 international journals in the areas of concrete materials and structures. He is the member of the following professional societies. Dr. Li’s research interests are in the field of connecting novel materials to structural response of concrete, especially including, recycled concrete, concrete nanotechnology, multifunctuional concrete, geopolymer concrete, properties under extremes, impact properties of cement composites, durability of cementitious materials, computational modeling, sea water and sea sand concrete, and sustainable construction materials. Project: Nano-geopolymer composites for underground prefabricated structures, ARC Research Hub (IH150100006) collaborating with Wuhan Zhihe Geotechnical Engineering, Co., Ltd, 2017-2019. Project: Multi-functional nano-modified cementitious materials for underground structures, University of Technology Sydney Early Career Researcher Grant (PRO16-2467), 2017-2018. © The Author(s) 2018. The corrosion rate of reinforcing steel is an important factor to determine the corrosion propagation of reinforced concrete structures in the chloride-laden environments. Since the corrosion rate of reinforcing steel is affected by several coupled parameters, the efficient prediction of which remains challenging. In this study, a total of 156 experimental data on corrosion rate from the literature were collected and compared. Seven empirical models for predicting the corrosion rate were reviewed and investigated using the collected experimental data. Based on the investigations, a new empirical model is proposed for predicting the corrosion rate in corrosion-affected reinforced concrete structures considering parameters including concrete resistivity, temperature, relative humidity, corrosion duration and concrete chloride content. The comparison between the experimental data and those predicted using the new empirical model demonstrates that the new model gives a good prediction of the corrosion rate. Furthermore, the uncertainty and probability characteristics of these empirical models are also investigated. It is found that the probability distributions of the model errors can be described as lognormal, normal, Weibull or Gumbel distributions. As a result, the new empirical model can provide an efficient prediction of the corrosion rate of reinforcing steel, and the model error analysis results can be utilized for reliability-based service life prediction of reinforced concrete structures under chloride-laden environments. © 2018 American Society of Civil Engineers. This study numerically investigates the failure processes of recycled aggregate concrete (RAC) and natural aggregate concrete (NAC). A two-dimensional simulation based on a discrete-element method (DEM) is conducted with a universal distinct-element code (UDEC) program. RAC is modeled by a combination of rigid Voronoi blocks cemented to each other using contacts for interfaces. The determination procedure of contact microparameters is analyzed, and a series of microscopic contact parameters in different components of modeled recycled aggregate concrete (MRAC) is calibrated using nanoindentation results. The complete stress-strain curves, fracture process, and failure pattern of numerical model are verified by experimental results, proving its accuracy and validation. The initiation, propagation, and coalescence of microcracks and subsequent nonlinear deformation behaviors of cement mortar, modeled natural aggregate, and recycled aggregate concrete are captured through DEM numerical simulations and compared with digital image correlation (DIC) results. It is found that both the new interfacial transition zone and the old interfacial transition zone are the weak links in RAC, where most microcracks initiate and propagate into the cement mortar region. The failure behaviors of MRAC revealed by both experimental and numerical results can effectively provide insights into the failure mechanism and enhancement of RAC. © 2018 Elsevier Ltd The stream of research on alkali-activated materials (AAMs) has expanded rapidly during the last decades owing to the potential as a viable alternative to cement-based materials. In addition to the load-carrying function, AAMs have been integrated with other functions to develop advanced construction materials, namely multifunctional AAMs. Multifunctional AAMs are intelligent systems not only serve a basic structural function but also exhibit other functional properties or have the abilities to react upon external stimuli or disturbances. Materials of this kind have tremendous potential to enhance the mechanical performance and durability of structure, improve the reliability and longevity of infrastructure, as well as reduce life-cycle service and maintenance cost. These multifunctional properties are mainly achieved through materials composition design, incorporation of functional elements, or microstructure modification. This paper presents an overview on designs and properties of multifunctional AAMs covering the smart functions, mechanical functions, and electrical functions, and with special attention to their definition, principles, and current progress. Furthermore, the challenges in the research of multifunctional AAMs have been discussed, as well as the future directions to increase the innovation and engineering application of these materials and structures. © 2018, © 2018 Informa UK Limited, trading as Taylor & Francis Group. As a very promising sustainable construction material, recycled aggregate concrete (RAC) has become a hot research topic and attracted wide attention. Although many investigations have been conducted, it is still a great challenge to product RAC with satisfactory and stable performance for practical engineering application. In recent years, nanotechnology has been introduced to RAC research and displayed distinct advantages over many traditional methods. This article is devoted to reviewing the current research on nanotechnology application in RAC, including nanoengineering and nanoscience. The corresponding results involving microstructure characteristics, mechanical properties, workability, and durability were summarized and discussed. It has been found that nanoscience has promoted better understanding of microstructure and various internal mechanism of RAC, while nanoengineering has helped RAC achieve dense microstructure, improved mechanical properties and durability. However, further efforts are required to realize the potential of nanotechnology and to bring breakthroughs in research and application of RAC. © 2019 Elsevier Ltd Cement-based sensors are increasingly used in smart concrete to self-sense and monitor the damages and cracks through the measurements of concrete electrical resistivity. The fundamental concepts, key components, manufacturing process, piezoresistivity measurements, and primary applications of cement-based sensors are reviewed in this paper. Various materials, mechanical and environmental factors affecting concrete piezoresistive properties are explicated. Some contradictory results from different studies are reported and discussed. Future perspectives of piezoresistive cement-based sensors are also delineated. The review reveals that there is an optimal conductor content, below which the sensor would perform more like plain concrete with high resistivity and low sensitivity, while excessively higher than which, the dispersion of the conductive phase could become difficult, thus increasing resistivity. The manufacturing process, such as the dispersion method of conductors and curing condition, plays a significant role in conductor distribution, matrix density and pore structure of the sensors, which, together with rheology of the sensor composite, consequently alters the piezoresistive properties of the sensors. In addition to responding to mechanical loading, cement-based piezoresistive sensor also has a great potential for monitoring behaviour of concrete under freeze-thaw cycling. It is expected that this review will provide not only an orientation for new researchers to explore and engage in related studies but also an insight for experienced researchers to perform transformational examinations into cement-based piezoresistive sensors. © 2019 Recently, the concept of engineered cementitious composites (ECCs) has been extended to the creation of engineered geopolymer composites (EGCs). Although showing similar mechanical characteristics (e. g., strain hardening and multiple cracking) to conventional ECC, the strength of existing EGC is generally low, and this sometimes restrains its applications. In the present study, a low-calcium (Class F) fly ash-based, polyvinyl alcohol (PVA) fiber reinforced EGC was developed and further modified by a ground-granulated blast-furnace slag (slag). The slag was used to replace the fly ash at content of 0%, 10%, 20%, and 30% (by weight). The effects of the slag on the mechanical properties (e.g., compressive strength, modulus of elasticity, uniaxial tensile behavior, flexural bending strength, and pullout bond strength) of the EGCs were investigated. The results revealed that all EGCs studied exhibited a strain/deflection hardening behavior under tension/flexure, and all slag replacements for fly ash enhanced strength-related properties but reduced ductility-related properties of the EGCs. The EGC mix with 20% slag replacement for fly ash (FA-20%S) had 102.3 MPa compressive strength, 6.8 MPa tensile strength, and 6.2 MPa bond strength, while the EGC mix with no slag (FA-0%S) had 72.6 MPa compressive strength, 4.7 MPa tensile strength, and 3.5 MPa bond strength at 28 days. These strength enhancements were mainly attributed to the improved density of the EGC matrix and the bond between the matrix and fiber. There are close relationships between the bond strength and other strengths, especially the tensile and flexural strengths, of the EGCs. © 2019 Elsevier Ltd Industrial solid wastes are inducing severe environmental problems, but the problem can be overcame by reusing them as construction materials. The sulfate resistances of sustainable concrete incorporating various solid waste materials, including waste glass powder (WGP), coal gangue powder (CGP) and fly ash (FA) were investigated in this study. Concrete mixes with different water to binder (w/b) ratios and containing various solid waste materials as partial replacement of Portland cement by ratios of 10%, 20%, and 30% were prepared. These mixes were immersed in the 5% Na 2 SO 4 solution for a total period of 22 months. The sulfate attack resistances were evaluated extensively based on visual appearance, mass change, compressive strength, splitting tensile strength, ultrasonic pulse velocity, mineralogy, and microstructure. The results indicate that regardless of the type and content of solid waste materials, the replacement of cement by solid waste materials exhibit a positive impact on the sulfate attack resistance. Under the same substitution level, WGP appear to be the most effective in offsetting the destructive effect of sulfate attack, followed by CGP and FA. Therefore, sustainable concrete incorporating solid waste materials can not only promote the recycling of solid waste, but also provide high sulfate attack resistance. © 2019 Elsevier B.V. Water treatment sludge (WTS) management is a growing global problem for water treatment plants (WTPs) and governments. Considering the scarcity of raw materials in many parts of the planet and unique properties of WTS, extensive research has been conducted on the application of WTS in the production of construction materials such as roof tiles, bricks, lightweight aggregates, cement, concrete and geopolymers. This paper critically reviews the progress in the application of WTS in construction materials, by synthesizing results from recent studies. Research findings have revealed that incorporation of 10% alum-based sludge in ceramic bricks is satisfactory with a small reduction of mechanical performance. Using the iron-based sludge, the bricks presented better mechanical strength than the reference clay-bricks. Concerning WTS application in concrete, 5% replacement of cement or sand by WTS was considered as the ideal value for the application in a variety of structural and non-structural concrete without adverse effect on concrete mechanical performance. Furthermore, this paper discusses sludge-amended concrete in terms of durability, potential leaching of toxic elements and cost, and suggests topics for future research on the sustainable management of WTS. © 2019 The reinforcing effect of graphene oxide on cementitious materials under high strain rate remains largely unknown. Existing studies on microfiber reinforced cementitious composites showed that the dynamic increase factor (DIF) decreases due to these fibres. This study reports that the reinforcing effect of graphene oxide nanosheets can, in contrast, increase with strain rate. Tensile splitting and compression tests were conducted under both static and dynamic loadings. High strain rate, up to 1700 s 1 , is achieved using a split Hopkinson pressure bar apparatus. It is found that the DIF of graphene oxide nanocomposite only increase when the DIF is higher than a threshold which is about 780 and 30 s 1 for compression and tensile test respectively. The increased of DIF was correlated with the speed of crack development and pull-out of the graphene oxide nanosheets. Also, the pull-out or fracture of graphene oxide on fragmented sand was also found a possible contributing factor to the increased DIF. The findings of this study indicate the future potential of atomic-thin nanosheets for materials under extreme impact and blast loading. © 2017 Elsevier Ltd In this study, a novel coupling testing protocol with separated repetitive loading and freezing-thaw cycles in salt-solution is designed to simulate coupling mechanical loading and complex environmental effects on durability and deterioration of recycled aggregate concrete (RAC). The Micromechanical properties and porosity of RAC were also characterized by scanning electron microscopy (SEM) and microhardness. The results show that the number and width of cracks of RAC and NAC under freeze-thaw cycles obviously increased with the increase of alternating times of repetitive load and the compressive stress level. The compressive strength losses for both RAC and NAC increase with the increase of compressive stress level and alternative times of repetitive load. However, the compressive strength of natural aggregate concrete (NAC) became lower than that of RAC after freeze-thaw cycles. It was found that the freeze-thaw resistance of RAC seems even better than that of NAC under the same freeze-thaw attacks and cyclic mechanical loading. It indicates that after freeze-thaw cycles in salt-solution, the durability of RAC is better than that of NAC. On the other hand, the microhardness and SEM characterization results indicate that the interface transition zone (ITZ) was a weak part in both RAC and NAC, and the ITZ in NAC obviously deteriorated faster than that of RAC. © 2017 Elsevier Ltd Graphene oxide (GO) is a novel class of two-dimensional nanoscale sheet material due to its excellent dispersibility in water, high aspect ratio and good intrinsic strengths. In order to obtain a well-distributed GO-reinforced cement composites, the dispersion of GO in water, alkali and several ionic species are investigated with the aid of UV–vis spectroscopy. High alkalinity and calcium ions are key factors inducing the agglomeration of GO in cement system. Dispersion of GO in simulated pore solution is the culmination of the alkali and salt experiments. Agglomeration of GO occurred when GO contacted with the simulated pore solution, highlighting the necessity to protect GO against such aggressive media. The test on surfactant compatibility was then carried out to ensure GO was effectively dispersed in polycarboxylate, air-entrainment and Gum Arabic admixtures within the pore solution. Polycarboxylate-based superplasticisers gave the most promising results to disperse GO in cement alkaline environment. Flexural experiments was performed to highlight the importance of fabrication protocol on the mechanical properties of GO-cement composites. The result shows that the amount of 0.03% GO by weight of cement can increase the flexural strength of GO-cement composite up to 67%. © 2018 Elsevier Ltd Graphite nanoplatelets (GNPs), promising in improving electrical properties of cement-based materials and its smartness, were used to prepare piezoresistive cement-based strain sensors (PCSSs) in this study. Their piezoresistive responses along vertical, horizontal and inclined directions were measured during applying a vertical cyclic compression. After calibrating free PCSSs by analyzing their gauge factors, three PCSSs are embedded in a four-point bending beam at different stress zones, i.e. uniaxial compression, uniaxial tension and combined shear and compression. In addition to investigating piezoresistive responses of PCSSs embedded in the beam, traditional strain gauges and finite element method (FEM) were also used to grasp the strains at relevant positions for comparison. For free PCSSs, It was found that the electrical resistances along vertical, horizontal and diagonal directions drop by amplitudes of 5.5%, 1.8% and 6.7% respectively, as the increasing of vertical compression. The gauge factor along loading direction was calculated to be 160.8, which illustrated a better sensitivity. In the four-point bending beam, the PCSSs in compressive zone and tensile zone can be used to presume the strain variation by considering the gauge factor obtained from the free PCSS. The reaction of the PCSS in shear zone can illustrate its strain features because a slight volume variation happened in this area, which can also be testified to be only 0.012‰with FEM analysis. © 2018 Elsevier Ltd The fracture behavior of unoiled/uncoated polyvinyl alcohol (PVA) fiber reinforced sulphoaluminate cement (SAC) matrices was experimentally investigated and compared with those of polypropylene (PP) fiber reinforced SAC and PVA fiber reinforced Portland cement (PC) matrices in this study. In the experimental investigation, three-point bending tests were carried out for notched fiber reinforced cement beams. Special attentions were paid on their deflection-hardening and multiple crack patterns. The different flexural behaviors between the plain SAC and PC matrices were evaluated using the double-K fracture model. The results indicate that the PVA fiber reinforced SAC matrices exhibited better flexural behaviors when compared with the PVA fiber reinforced PC matrix having comparable matrix strength. The bond strength between SAC matrix and PVA fiber are relatively better than that between the counterpart PC matrix and PVA fiber, while the bond strength between SAC matrix and PVA fiber is obviously stronger than that between the SAC and PP fibers. © 2017 ICE Publishing: All rights reserved. In order to better understand the failure mechanism of recycled aggregate concrete (RAC), a numerical study on modelled recycled aggregate concrete (MRAC) was conducted to investigate the plastic-damage response and crack propagation under uniaxial loading. In the numerical model, the nanoscale mechanical properties and the thickness of the interfacial transition zones (ITZs) were obtained based on advanced nanoindentation. The constitutive relationships of new and old cement mortars and corresponding ITZs were developed using plastic-damage constitutive relationships. The effects of the relative mechanical properties between new and old cement mortars on the failure pattern and stress-strain response of MRAC were investigated. After calibration and verification with the uniaxial compression test, the numerical model was found to be able to reveal the failure pattern and stress-strain curves of MRAC under uniaxial tension. The results showed that microcracks usually first appear around the weak new and old ITZs, and then propagate into the new and old cement mortars. With an increase in the relative strength between new and old cement mortars, the microcrack initiation locations gradually shifted from the new ITZs to the old ITZs. Therefore, the numerical results can provide insight into the modification of RAC using mix design optimisation and ITZ enhancement. Copyright © 2018 by ASTM International The influences of nanoparticles on the mechanical properties and microstructures of recycled aggregate concrete (RAC) were investigated in this study. The compressive and flexural strengths of RAC with different dosages of nanoSiO2 (NS) and nanoCaCO3 (NC) were tested. Both the scanning electron microscopy (SEM) and mercury intrusion porosimetry (MIP) techniques were applied to analyze the microstructures and porosity of interfacial transition zones (ITZs) in RAC. Based on the comparison on compressive strength and flexural strength, the NS is more effective than the NC for improving the mechanical properties of RAC. Dispersion of NC particles by a superplasticizer can somewhat improve the early-age strength of RAC but is unlikely to enhance the 28-day mechanical strengths. This may be attributed to the better dispersion and pozzolanic activity of NS compared to NC. The results show that a denser microstructure and a reduction of porosity within ITZs were observed by incorporating NS, which occurred along with the improvement of the mechanical strengths of RAC. Moreover, the NS-modified RAC exhibits less total porosity than the NC-modified RAC. The NS-modified RAC mainly contains small size pores, but the NC-modified RAC has more large pores than the NS-modified RAC, which has negative effects on the mechanical properties of RAC. © 2017 American Society of Civil Engineers. The filling layer of a China rail track system III (CRTS III) type ballastless track structure of a high-speed railway is a complicated structure typically constructed from self-compacting concrete (SCC). Excellent properties of SCC are of great importance to ensure the quality of construction technology and long-term service performance of the filling layer. In this study, preparation methodologies and properties of SCC applied as a filling layer are systematically investigated by series of experiments. The results indicate that high-performance SCC with high stability in a fresh state and low deformation in a hardened state was successfully achieved by optimizing aggregates and binder components. Use of viscosity-enhancing compounds can not only effectively improve the workability of fresh SCC, but also significantly enhance mechanical properties and decrease drying shrinkage and creep of hardened concrete. © 2018 Elsevier Ltd Actual dispersion of graphene oxide (GO) in cement paste was investigated by using both X-ray computed tomography and X-ray photoelectron spectroscopy. It was found that GO nanosheets are mainly agglomerated, as an individual phase, with platelet-like morphology and little GO being absorbed onto surfaces of cement particles and hydration products. By performing an electrical resistivity test, GO agglomerates are found to be more electrically insulative than cement paste. Therefore, it is not possible to develop self-sensing cement composites by incorporating GO directly without resolving its dispersion issue. However, GO agglomerates enhance the flexural strength of cement paste because of their special morphology and intrinsic strength. Results showed that the flexural strength of cement paste was increased by 83% with incorporation of 0.04% GO by weight of cement. © 2018 The authors regret that the SEM image of GO (Fig. 1) should be replaced by a more representative one, which is provided by the material supplier, as given below. The workability measurement (Fig. 2) was plotted incorrect and should be revised by the following. Consequently, the sentence in Abstract should read as follows: The mini-slump diameter was reduced by 27% with the incorporation of 0.03% by weight GO in cement paste. The sentence in Section 4.1 should read as follows: However, when 0.03% by weight GO was added, the mini-slump diameter showed a sudden decrease to a level that was about 27% lower than that of the plain cement paste C. The Acknowledgement should read: The authors are grateful for the financial support of the Australian Research Council in conducting this study. Thanks also go to Mr. Samuel Chuah and Mr. Hongsen He for their great support in materials testing during their stay at the Monash University. The authors would like to apologise for any inconvenience caused. © 2018 Elsevier Ltd Concrete strength (CS) is one of the most important performance parameters that are crucial in the design of concrete structure. The reliable prediction of strength can reduce the cost and time in design and avoid the waste of materials caused by a large number of mixture trials. In this study, a novel predictive model is put forward to predict the CS of high performance concrete (HPC) using support vector machine (SVM) approach, which has benefits of nonlinear mapping, high robustness and great generalisation capacity. In the proposed model, the input variables include the contents of water, cement, blast furnace slag, fly ash, super plasticiser, coarse and fine aggregates and curing age, which produces the CS of HPC as the output. In order to improve the model performance, a type of enhanced cat swarm optimisation (ECSO) is adopted to optimise the key parameters of SVM. Finally, the model is trained and evaluated using a total of 1761 data records, which are collected from existing literatures. The results indicate that the proposed SVM-based model exhibits better recognition ability and higher prediction accuracy than other commonly used models, and it can be considered as an effective method to predict the CS property of HPC in infrastructure practice. © 2018 American Society of Civil Engineers. The effect of cyclic loading deterioration on freeze-thaw and carbonation resistances of concrete were experimentally investigated in this study. A novel loading method was designed, which simultaneously considers both mechanical loading and environmental actions for concrete. It shows that with the increase of cyclic compressive loading, the porosity and water absorption of concrete initially decrease but then increase when the stress is above a threshold level because of the cracking initiation caused by cyclic compression. With the increase of concrete porosity, both dynamic elastic modulus loss and carbonation depth obviously exhibit an increasing trend. On the other hand, under the same stress level, the freeze-thaw and carbonation resistances of high-strength concrete are relatively superior to those of low-strength concrete. Compared with the unloaded concrete, the carbonation depth and dynamic elastic modulus loss after mechanical loading below the stress level threshold are lower. This is probably due to the denser microstructure compacted by the compression. However, if the loading level becomes above the threshold level, both the carbonation depth and dynamic elastic modulus loss dramatically increase, which is due to the cracks initiation and propagation after cyclic loading deterioration. Therefore, the combination of mechanical and environmental actions is more severe than a single environmental action without considering the mechanical loading. © 2018 American Society of Civil Engineers. This paper investigates the effects of weak acids (citric acid, boric acid, and trisodium citrate) with dosages of 0.5, 1.5, and 2.5% of MgO weight on compressive strength, water resistance, and drying shrinkage of magnesium oxysulfate (MOS) cement. Hydration products and microstructure of typical samples are studied by using X-ray diffraction (XRD), Fourier transform infrared spectroscopy (FTIR), differential thermal analysis-thermogravimetry (DTA-TG), and scanning electron microscope (SEM) facilities. The results show that compressive strength of MOS cement increases with an increasing MgO/MgSO4 molar ratio and decreasing H2O/MgSO4 molar ratio. The addition of citric acid, boric acid, or trisodium citrate significantly enhances compressive strength and water resistance and alleviates drying shrinkage of MOS cement paste. With the incorporation of weak acid, 5 · 1 · 7 [5Mg(OH)2 · MgSO4 · 7H2O] phase, which is a new magnesium subsulfate crystalline product with a needlelike crystal whisker shape, forms in cement paste. This substance behaves in a criss-crossing manner and fills in pores and microcracks, inducing the improved performance of MOS cement paste. With optimum dosages of 0.5, 2.5, and 0.5%, respectively, citric acid, trisodium citrate, and boric acid exhibit decreasing improvement effect. © 2018 Elsevier Ltd A total of 158 experimental tests of shear behavior of corroded reinforced concrete (CRC) beams under action of concentrated load, published in the literature were collected and compiled into a shear strength database. This database was firstly used to discuss important parameters which affect the shear strength of CRC beams. The results show that the effect of stirrups' corrosion on shear capacity of CRC beams is greater than that of longitudinal reinforcement corrosion. The shear span-to-depth ratio is also an important factor on shear strength of CRC beams. Total 9 available empirical models for predicting the residual shear strength are evaluated and compared based on the test database. It is found that eight of the nine models underestimate the shear strength of CRC beams while the other model gives the overestimated results. It is in this regard that a new empirical model for predicting the residual shear strength of CRC beams is proposed, in which a reduction coefficient is incorporated with the consideration of the effect of stirrups' corrosion as well as shear span-to-depth ratio. The comparison studies demonstrate that the new proposal can provide an effective and accurate prediction of the shear capacity of CRC beams with a wide range of reinforcement corrosion damages. © 2018 Elsevier Ltd Advanced characterization techniques have provided powerful tools for characterizations of materials at micro- and nano-scales worldwide. Although some overviews on nanomechanical characterizations of cement-based materials have been published, they have often focused on nanoindentation. Very limited reviews have been reported on the applications of modulus mapping, PeakForce quantitative nanomechanical mapping, and nanoscratch for researches on the micro and nanoscale compositions, structures and mechanical properties of modern cement-based materials. This paper is aimed at filling this blank. Based on an extensive literature review and authors' own experience, the basic knowledge (e.g., general concepts, developments, and progresses) involved in the state-of-the-art nanomechanical characterization techniques have been systematically summarized in this paper. The critical issues (e.g., sample preparation procedures and requirements, measurements, and data analysis methods) of these techniques have been discussed in details. The applications of these techniques, especially their suitability for critical characterization of different scales of interfaces of cement-based materials are compared. Finally, the future perspectives of these nanomechanical characterization techniques are highlighted. It is expected that the outlook of this paper can help future researchers make scientific justification on selection of nanomechanical characterization methods and steer inquisitive readers into substantial details that may lead them to successful applications of these advanced techniques. © 2018, The Author(s). The effects of different contents and particle sizes of waste glass powder on alkali–silica reaction (ASR) expansion of cementitious composite bar were investigated in this study. Waste glass powder with particle size less than 300 m exhibits an excellent mitigation effect on ASR expansion. With larger content and smaller particle size, the mitigation effect of waste glass powder on ASR expansion gradually increases. The mitigation effect of waste glass powder with particle size ranging from 38 to 53 m and 20% by weight of cement seems relatively better than that of fly ash. When the waste glass powder content reaches 30%, the mitigation effect is still effective and almost the same as that of fly ash. However, the waste glass powder with particle size larger than 300 m presents negative mitigation effect on ASR expansion when the replacement rate is larger than 30%. On the other hand, the waste glass powder and calcium hydroxide (CH) further react, and produce more calcium–silicate–hydrate gels, which apparently reduce the amount of CH. Moreover, the increasing content of waste glass powder results in a lower pH value in the pore solution of cementitious composite. © 2016 Elsevier LtdThe effects of a novel heat curing regime and longitudinal reinforcement ratio on early-age shrinkage of ultra-high performance concrete (UHPC) were experimentally investigated in this study. The microstructure, porosity and calcium hydroxide (CH) content of UHPC after different heat curing durations were characterized with scanning electron microscopy, mercury intrusion porosimetry and thermal analysis. The results indicate that slight shrinkage was observed when the heat curing duration was less than 60 min and curing temperature reached 48 °C. However, when the heat curing duration approached 70 min and curing temperature was around 55 °C, the early-age shrinkage increased dramatically. It was found that the early-age shrinkage is approximately 450 after 48 h of heat curing. The results also show that the early-age shrinkage of UHPC significantly decreased by percentage of 33–60% with the increase of longitudinal steel reinforcement ratio from 2.0 to 4.52%. Meantime, after 10 h of heat curing, the cement hydration and secondary hydration in UHPC tend to finish, which consequently leads to dense microstructure and low CH content in UHPC. © 2017 Elsevier Ltd The effects of nano-particles including nano-silica (NS) and nano-limestone (NL) on the crack propagation and microstructure properties of recycled aggregate concrete (RAC) were experimentally investigated in this study. The crack initiation and propagation of nano-particles modified RAC with different nano-particle modification were evaluated using digital image correlation technique (DIC). The microstructures and porosity of interfacial transition zones (ITZ) in nano-modified RAC were also examined using scanning electron microscopy (SEM) and mercury intrusion porosimetry (MIP). It was found that the micro-cracks were typically derived from relatively weak ITZs in RAC, and then progressively propagated along the compressive loading direction. The meso-crack developments eventually led to final splitting failure. The results indicated that compared to NL, NS was more effective in improving the microstructure properties and enhance the mechanical strength of RAC. The porosity and water absorption of RAC were obviously reduced by the NS incorporation. However, due to particles agglomeration, NL could not effectively improve the microstructure of RAC for further enhancing the RAC mechanical properties. Furthermore, in terms of severe particles agglomeration, NL was even detrimental to the mechanical strength of RAC especially at the late-age. © 2017 Elsevier Ltd The compressive mechanical behaviors of recycled aggregate concrete-filled steel tube (RACFST) stub columns after exposure to elevated temperatures were experimentally investigated in this study. The RACFST stub columns incorporating different recycled coarse aggregate (RCA) replacement ratios of 0, 50% and 100% were heated under elevated temperatures of 200 °C, 500 °C, and 700 °C. The results show that the compressive strength and elastic modulus of RACFST columns were relatively inferior to those of the corresponding natural aggregate concrete-filled steel tube (NACFST) columns after exposure to the same elevated temperatures, and the degradations became more pronounced with increasing RCA replacement ratio and higher temperature. This phenomenon might be attributed to the lower resistance of recycled aggregate concrete (RAC) than natural aggregate concrete (NAC) when was exposed to elevated temperatures. However, after elevated temperature exposure, the peak strain of RACFST stub column was relatively higher than that of the NACFST counterpart. Degradation regression formulas of mechanical properties and deformation behaviors of RACFST stub columns after exposure to elevated temperatures were proposed and agreed well with the experimental results. © 2017 Elsevier Ltd It has recently been found the graphene oxide (GO) aggregates form in cement paste due to the chemical cross-linking of calcium cations. Therefore, the effects of GO addition on the properties of cement based materials should be dependent on the properties of GO aggregates rather than GO nanosheets. In this study, GO aggregates were first characterized by particle size measurement. Then, the effects of GO aggregates on the degree of hydration, sorptivity, and tensile strength of cement paste were investigated. The aspect ratio of GO aggregates is much larger than that of the original GO nanosheets. Compared to plain cement paste, the increase of non-evaporable water content of the cement paste was found to be very limited, around 1.17% and 3.90% for cement pastes containing 0.02% and 0.04% by weight GO, respectively. The sorptivity of cement paste, especially the secondary sorptivity, was notably reduced for GO incorporated cement paste. The tensile strength was significantly improved by GO aggregates. Incorporation of 0.04% by weight GO increased the tensile strength by 67% compared to that of plain cement paste. © 2017 Elsevier Ltd In this study, the effects of graphene oxide (GO) agglomerates on the workability, hydration, microstructure, and compressive strength of cement paste were addressed. The workability of cement paste was reduced because of the presence of GO agglomerates, which entrap a large amount of water. The mini-slump diameter was reduced by 21% with the incorporation of 0.03% by weight GO in cement paste. Hydration of the cement paste was accelerated due to nucleation sites provided by GO agglomerates serving as seeding material in the cement paste. The incorporation of GO refined the pore structure of the cement paste. The incorporation of GO was found to have much greater impact on macropores than on large and small mesopores. At 28 days, the incorporation of 0.04% by weight GO produced a 14% improvement in the compressive strength of cement paste. Below 0.03%, the incorporation of GO had no positive effects on compressive strength. © 2017 American Society of Civil Engineers. The effects of nanoalumina (NA) and graphene oxide (GO) on the early-age hydration and mechanical properties of portland cement pastes were investigated in this study. The hydration heat release rate and cumulative heat of cement pastes incorporating different dosages of NA and GO were evaluated using an isothermal calorimeter measurement method. Early-age electrical resistivity development was investigated by a noncontact electrical resistivity technique. The results show that both NA and GO could efficiently accelerate cement hydration. As a physical filler, NA significantly accelerates the hydration of tricalcium aluminate (C 3 A) in cement. On the other hand, GO is able to obviously reduce the dormant period of cement hydration and shift the heat flow peaks to the left by accelerating the hydration of tricalcium silicate (C 3 S) in cement. Compared to plain cement pastes, both the compressive and flexural strengths of cement pastes incorporating NA or GO are significantly increased. However, when NA and GO contents exceed the optimal amounts, improvements in flexural strength tend to decline, which is probably due to particle agglomeration. NA-cement paste exhibited slightly higher electrical resistivity than plain cement paste during hydration acceleration and deceleration stages. But GO-cement paste clearly showed lower electrical resistivity, which might be attributed to iron diffusion caused by GO with large surface areas. © 2017 Elsevier Ltd The effects of graphene oxide (GO) on the early-age hydration process and mechanical properties of Portland cement paste were experimentally investigated in this study. Based on an isothermal calorimeter measurement, the hydration rate of cement was observed to increase with the increase of GO content by nucleation effect. On the other hand, the electrical resistivity development of GO-cement paste was monitored using a non-contact electrical resistivity device. The result showed that electrical the resistivity of GO-cement paste was evidently higher than that of plain cement paste. However, cement paste with excessive amounts of GO exhibited a decreased electrical resistivity due to the massive ion diffusion caused by GO. Compared to plain cement paste, the GO-cement paste exhibited obviously higher compressive and flexural strengths, but the enhancements in compressive strength began to decline when the GO amount was greater than 0.04%. The microstructure characterization indicated that GO can apparently densify the cement pastes with less porosity and hydrates networking, which is consistent with the results of hydration acceleration and strength enhancement. © 2017 Porosity is an intrinsic property of many cementitious materials. This study uses a new centrifugation-based low-melting-point metal intrusion technique to characterize and analyze the shape of pores in cementitious materials. Low energy electrons with ultra-long beam dwell time are used to obtain nano meter level resolution of the pore shape. Three descriptors, namely circularity, solidity, and aspect ratio, are proposed to represent the area-perimeter relationship, hydration and packing and 3D shape of the pores, respectively. Circularity is found to hold a consistent power correlation with pore size. Based on this correlation, the Washburn's equation is modified to correct the biased prediction of pore size using mercury intrusion porosimetry (MIP). Solidity, is found to decrease with increased pore size, denser packing of cement particles and more hydration products. Aspect ratio of the observed pores is found to average at about 2 representing an oblate ellipsoid shape of pore in 3D space. © 2017, Editorial Department of Journal of Building Materials. All right reserved. The crack evolution of recycled aggregate concrete (RAC) and the performance of RAC after incorporation of different amount of nanoparticles (nanosilica sol and nanolimestone) were studied. Under uniaxial compression, the crack development of RAC specimens with different water-cement ratios (0.4, 0.5 and 0.6) and aggregate replacement ratios were observed by high speed camera. Scanning electron microscopy (SEM) observation and mercury injection test were conducted for studying the microscopic morphology and pore structure of the interfacial transition zone (ITZ) of nanomodified RAC and the influences of different mass fraction of nanoparticles and different treatment processes on it were analyzed. The results indicate that the crack of RAC is usually derived from new ITZ or old ITZ (determined by the weaker one) and then it gradually extends to the surrounding area. The evolution of crack eventually leads to the longitudinal splitting failure of the RAC. Nanosilica sol could improve the microstructure of ITZ. Therefore, the strength of nanosilica sol modified RAC was enhanced. But the improvement by nanolimestone is not very significant for it can't enter the interface transition zone to fill the pore in it. © 2017, Editorial Department of Journal of Hunan University. All right reserved. The dynamic mechanical performances of recycled aggregate concrete (RAC) incorporating with 1% to 2% nano-SiO2or nano-CaCO3were tested by Split Hopkinson Pressure Bar (SHPB). The effects of different kind is of nanoparticles and different dosages on the mechanical performances of RAC were investigated. The results revealed that RACs with nano-SiO2and nano-CaCO3all zhowed higher dynamic compressive strength than the control RAC, and the nano-SiO2was more effectire than nano-CaCO3in enhancing the dynamic compressive strength of RAC. But RACs with high dosage of nano-SiO2or nano-CaCO3usually showed lower dynamic compressive strength than that of low dosage one, and the RAC incorporating with 1% nano-SiO2achieved the highest dynamic compressive strength. Nano-CaCO3exhibited more advantage in improving the deformation performance and energy absorption capacity of RAC. Both nano-SiO2modified RAC and nano-CaCO3modified RAC showed lower dynamic increase factor than control RAC. The size of magnesium oxide may greatly affect its behaviour in cement-based materials (CBMs), and this has not been fully investigated. The reactivity of ultrafine magnesium oxide (UFM) of size 40 nm to 20 m was assessed, and its effects on the compressive strength and volume stability of cement mortar were investigated. The results showed that the hydration of UFM followed the first-order reaction mode in the first 3 d and then slowed down due to the alteration of the reaction to the diffusion-controlled mode. UFM contributed to an increase in compressive strength and a decrease in shrinkage of CBMs at the very early age, but hindered the hydration of cement at later ages, coarsened the microstructure, and decreased the later-age shrinkage to a much smaller extent than normal light-burnt magnesium oxide. The relatively high hydration reactivity of UFM may contribute to the formation of a more compact gel structure around cement particles at the very early age, which may hinder the reaction of cement at later ages, thus leading to the slowed property gain of CBMs at later ages. The findings from this study may help in the selection of magnesium oxide types for achieving a desired CBM with certain properties. © 2017 Elsevier Ltd This study investigated the impact behaviors of recycled aggregate concrete-filled steel tube (RACFST) after exposed to elevated temperatures by experimental and numerical studies. The impact test on RACFST was conducted by a split Hopkinson pressure bar (SHPB) with 100 mm-diameter. After the validation of finite element method simulation by the experimental results, parametric analysis were applied to analyze the effects of RAC strength, steel strength and steel ratio on the impact behaviors and deformation properties of the RACFSTs exposed to elevated temperatures ranging from 20 °C, 200 °C to 500 °C and to 700 °C. The results show that both the increases in RAC strength, steel strength and steel ratio significantly enhance the impact resistance of RACFST. However, when RAC strength deteriorates quickly after exposure to high temperature, the increase in RAC strength just slightly improves the impact properties of RACFST, especially after exposure to elevated temperatures higher than 500 °C. In conclusion, increasing steel ratio is an effective way for improving the impact behaviors of RACFST, but resulting in higher cost for practical application. For the impact design of RACFST, steel strength and steel ratio are two essential factors in terms of impact behavior enhancement and cost efficiency. © 2016, Copyright © Taylor & Francis Group, LLC. Shape memory alloys (SMAs) in the form of rings or tubes with two-way shape memory effect (TWSME) have been applied to high-speed precision micro-mechanical systems. This study investigates the development of NiTi alloy rings with TWSME and analyzes the effects of annealing and thermo-mechanical treatments. The results show there is a maximum in TWSME with respect to annealing temperature, loading deformation, training temperature, and cycle, respectively. The TWSME of SMA rings stabilizes earlier than structure dimension during training. The annealing and training change phase transition temperatures, which has a negative effect on the SMA ring with application to clamping device. A prototype ring made of Ni-49.2 at%Ti was developed and applied to a high-seed precision micro-spindle. Its performance under static and ultra-high speed rotation conditions was tested. The results show the ring developed in this study satisfies the operation and clamping requirements of high-speed precision micro-mechanical systems. © 2015, RILEM. Three types of nanomechanical methods including static nanoindentation, modulus mapping and peak-force quantitative nanomechanical mapping (QNM) were applied to investigate the quantitative nanomechanical properties of the same indent location in hardened cement paste. Compared to the nanoindentation, modulus mapping and peak-force QNM allow for evaluating local mechanical properties of a smaller area with higher resolution. Beside, the ranges of elastic modulus distribution measured by modulus mapping and peak-force QNM are relatively greater than that obtained from nanoindentation, which may be due to a result of the shaper probe and local confinement effect between multiple phases. Moreover, the average value of elastic modulus obtained using peak-force QNM were consistent with those obtained by modulus mapping, while the different in modulus probability distribution could be related to the different nanomechancial theories and contact forces. The probability distributions of elastic modulus measured using nanomechanical methods to provide a basis for the different types of phases existing in cement paste. Based on the observation with high spatial resolution, cement paste can be likely found as nanocalse granular material, in which different submicron scale or basic nanoscale grain units pack together. It indicates that the peak-force QNM can effectively provide an effective insight into the nanostructure characteristic and corresponding nanomechanical properties of cement paste. Copyright © 2015, American Concrete Institute. All rights reserved. Nanoindentation, quantitative modulus mapping, and PeakForce quantitative nanomechanical mapping (QNM) are applied to investigate the quantitative nanomechanics of hardened cement paste at different spatial resolutions. The elastic modulus measured by static nanoindentation is slightly higher than those measured by the other methods. The average elastic modulus and probability obtained by PeakForce QNM are typically consistent with those found by modulus mapping. Both modulus mapping and PeakForce QNM can be used to discriminate different material phases in cement paste at the nanoscale. It concludes that cement paste is a granular material in which the sub-micron scale grains or basic nanoscale units pack together. Moreover, the high resolution Peak-Force QNM can provide an efficient tool for identifying nanomechanical properties, particle sizes, and thickness of the interface between different nanoscale grains. ©, 2014, Science Press. All right reserved. In this study, systematic experimental research was carried out to investigate the crack propagation of modeled recycledag gregate concrete (MRAC) under uniaxial compressive loading. A two-dimensional nondestructive digital image correlation (DIC) technique was applied to record the initiation and propagation of surface micro-cracks. The obtained results indicate that the fracture process and crack pattern of MRAC are greatly affected by the relative strength of new interfacial transition zone (ITZ) and old ITZ. The bond cracks first appear around the weak ITZs and then propagate into the mortar region by connecting with each other. When the strength of the new ITZ is inferior to that of the old ITZ, the first visible crack mostly appears at the new ITZ region. Also, when the strength of the new ITZ is better than that of the old ITZ, the first visible crack mostly appears at the old ITZ region. When the strength of the new ITZ is equal to that of old ITZ, the first observable cracks appear around both the new and old ITZs. Based on the propagation and coalescence processes of the surface micro-crack, an in-depth analysis was carried out on the whole failure process to reveal the failure mechanism and the crack evolution of recycled aggregate concrete. Li, WG, Xiao, JZ, Huang, L & Shah, SP 2014, 'Experimental study on mechanical properties of interfacial transition zones in recycled aggregate concrete', Hunan Daxue Xuebao/Journal of Hunan University Natural Sciences, vol. 41, no. 12, pp. 31-39. ©, 2014, Hunan University. All right reserved. The mechanical properties of Recycled Aggregate Concrete (RAC) with different mixing approaches were comparatively investigated. Based on the experiments on the Interfacial Transition Zone (ITZ) of RAC by nanoindentation technique and scanning electron microscopy, the results indicate that, for the new ITZ with Normal Mixing Approach (NMA), the elastic modulus distribution appears to decrease significantly from the old paste matrix surface, while for the new ITZ with Two-Stage Mixing Approach (TSMA), there is no obvious trend indicating that the elastic modulus increases or decreases with the increase of distance. For the old ITZ, the elastic modulus increases as the distance increases from original aggregate surface. The TSMA can improve the microstructures of the new ITZ by reducing the volume fraction of voids and calcium hydroxide. Correlating the nanomechanical properties of ITZ and microstructure with the compressive strength of RAC, it can be concluded that TSMA can enhance the mechanical properties of RAC by improving the mechanical properties and microstructure of the new ITZ. In order to investigate the failure processes of Recycled Aggregate Concrete (RAC), cracking behavior of modeled RAC specimens under compressive loading was investigated using Digital Image Correlation (DIC). Strain and displacement contour maps were produced to analyze the cracks' initiation and propagation during loading. The testing results indicate that the discrepancy between the elastic moduli of coarse aggregates and mortar matrix significantly influences the mechanical properties and crack patterns of the modeled materials. It is found that the failure process is related to the relative strength of coarse aggregate and mortar matrix. For modeled RAC, the first bond cracks appear around both the old and new interfacial transition zones (ITZ), and then propagate into the old and new mortar matrix by connecting each other. The observation implies that the initiations and propagations of microcracks are different between RAC and Natural Aggregate Concrete (NAC). The findings in this investigation are useful to improve the mechanical properties of RAC by optimizing the mix proportion. © 2012 Elsevier Ltd. All rights reserved. Based on the mechanical properties of each material phase in recycled aggregate concrete (RAC), a two-dimensional modeled RAC was built, and the stress distribution characteristics of the modeled RAC under uniaxial compressive were obtained by meso-level numerical analysis. A parametric analysis was conducted to investigate the sensitivity of the stress distribution of the modeled RAC, which focused on different mechanical parameters of natural aggregate, interfacial transition zone (ITZ) and old hardened mortar. Results show that a concentration of tensile stress and shear stress produces at new and old interfacial transition zones between the natural aggregates. The higher elastic modulus of natural aggregates are, the higher the magnitude of stress concentration is, and the higher elastic modulus of the interfacial transition are, the lower the magnitude of stress concentration is. Whereas the effects of the elastic modulus of old hardened mortar on stress concentration are not evident. A modeled recycled concrete is proposed. According to the meso- and micro-level mechanics parameters and constitutive relationships of the five-phase medium materials of recycled concrete, the failure mechanism of recycled concrete is numerically simulated. An investigation is made into the replacement of recycled coarse aggregate, the strength of the new or old hardened cement paste, the thickness of the old hardened cement paste, and the strength of interfacial transition zone (ITZ) on the mechanical properties of modeled recycled concrete under uniaxial compression. The results indicate that the strength of the new and old hardened cement paste have a remarkable influence on the initial elastic modulus and peak stress. The thickness of the old cement paste has some certain influence on the initial elastic modulus and peak strain. Furthermore, the influence of the strength of interfacial transition zones on the initial elastic modulus, peak stress and peak strain is not distinctive. The 4R principle refers to reduce, reuse, recycle and regeneration, which should be implemented in the process of concrete treatment. In terms of the special micro-structural properties and self-repairing capacity, concrete is one kind of regenerative construction materials. Through proper handlings, self-repairing (crack close-up) of concrete cracks is possible in the concrete hydration damaged region. Due to the effect of heterogeneous nucleation and subsequent crystal growth of calcium hydroxide, a better bonding strength forms interlocking the new and old concrete interfaces. A proposal on the relationship between the self-repairing, regeneration function of concrete and the rehabilitation of historic buildings is suggested, this is based on the formed process of the bonding strength of the interfaces and the function on concrete repairing. Besides the constitution and features of the microstructure of concrete, the relationship between the micro-structure and the macro-mechanical property is also investigated in this paper. © (2010) Trans Tech Publications, Switzerland. Liu, Q, Xiao, JZ & Li, WG 2010, 'Axial tensile test and lattice model simulation on recycled concrete', Sichuan Daxue Xuebao (Gongcheng Kexue Ban)/Journal of Sichuan University (Engineering Science Edition), vol. 42, no. SUPPL. 1, pp. 119-124. The mechanical parameters of each phase of recycled concrete such as the old hardened mortar, new hardened mortar, and interfacial transition zone (ITZ) were obtained by axial tension tests, and the failure mechanism of recycled concrete under axial tensile loading was studied. Based on the relevant knowledge of solid mechanics and mechanical properties of each phase of recycled concrete, a new meso-level lattice model of recycled concrete was proposed. According to the material parameters of each phase of recycled concrete, lattice model simulation on the failure mechanisms of the recycled concrete under axial tension was carried out by the lattice model, the axial tensile stress-strain relationship curves for recycled concrete were attained, and the internal damage process and tensile failure mechanism of recycled concrete were discussed. The results showed that the tensile fracture occurred approximately in the old or new hardened mortar, and the results of lattice model simulation were consistent with those of axial tensile tests. © 2018 Institute of Physics Publishing. All rights reserved. Coarse aggregate settlement may occur during concrete pouring, which affects the ability to resist projectile attack. In order to study the anti-penetration performance of concrete, and obtain high penetration resistance concrete, mesoscale finite element model of different aggregate space distribution of concrete was established, the numerical simulation of long rod rigid projectile penetrating into different concrete was conducted. The results showed that aggregate settlement had great influence on target scabbing; aggregate size and settlement had limited influence on projectile residual velocity. © 2017 Taylor & Francis Group, London. Investigation on effect of Graphene Oxide (GO) on hydration process of Portland cement paste was comprehensively conducted using non-contact electrical resistivity measurement. GO additions from 0.01 to 0.08% by weight of cement were incorporated into cement paste with water/cement ratio of 0.40. The electrical resistivity development of cement pastes incorporating GO additions were monitored by non-contacting measurement method. It shows that the electrical resistivity of GO-cement paste increased at early-age compared to pure cement paste. However, because of ions diffusion caused by GO in liquid phases, the electrical resistivity of GO-cement paste declined increased when high GO additions were incorporated. Moreover, the microstructure characterization indicated that GO can refine the microstructure of GO-cement pastes with more connected hydration products. Zhang, Z, Shao, XD, Li, WG & Cao, JH 2014, 'A lightweight composite bridge deck system', Bridge Maintenance, Safety, Management and Life Extension - Proceedings of the 7th International Conference of Bridge Maintenance, Safety and Management, IABMAS 2014, International Conference of Bridge Maintenance, Safety and Management, Shanghai, China, pp. 1422-1427. Based on some issues of existing Orthotropic Steel Deck (OSD) bridges, an innovative composite bridge deck system composed of OSD and Compact Reinforced Reactive Powder Concrete (CRRPC) overlay is presented. The Stress Reduction Factor (SRF) and tensile properties are targeted to evaluate its effectiveness. The SRF computation results reveal that thin CRRPC overlay drops the maximum stress from 178.20 MPa to 75.36 MPa in the deck plate and it extends the fatigue life by 13.22 times. Furthermore, several direct-tension tests of both with and without steel-bar reinforcement are implemented. Those tests demonstrate that the maximum post-cracking stresses are increased by four times when reinforced with steel-bars. Eventually, an overload fatigue test is employed to assess the fatigue resistance of the composite deck system. None of visible crack occurs after test under an equivalent stress range of 13.04 MPa. Therefore, OSDCRRPC composite bridge deck has a good potential to be successful. © 2014 Taylor & Francis Group.